The Mackintosh Bowling Club in Roath, Cardiff is very proud of it’s well kept green, many hours are spent maintaining the green throughout the year to ensure the playing surface is of the highest quality. The club has an on-site car park, allowing for easy access to the bowls green. Additionally, the club has excellent changing room and toilet facilities which are housed in the new building. Through the Summer, Mackintosh Bowls Club compete in a number of local leagues. 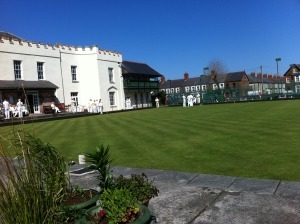 The Men belong to the Welsh Bowls Association playing league matches on a Saturday afternoon. The Men also play in the midweek league on a Wednesday and the alliance league on a Tuesday or a Thursday afternoon. The Ladies bowls team was reformed in 1991 and now play in the South Glamorgan evening league and the South Glamorgan afternoon league on a Thursday. There are further opportunities to compete with regular internal competitions running within the club. The Winter months doesn’t stop our bowlers from playing, with an opportunity to play short mat bowls indoors, inside our fantastic new facility. The ladies meet every Wednesday morning from 10:30am-12pm. The Men play every Wednesday evening from 7:30pm. The club has a very friendly environment and welcomes any new bowlers to come along and try out the club. For new members, the membership fee currently costs £75. If you would like more information please give Club Secretary Cynthia Pulsford a call on 02920 383182.